Here are 80 eerie projects—scary decorations, ghosts by the window, ghouls in your yard and on fences and porches.Creative ideas for every room and area will make your home the area’s Halloween masterpiece. 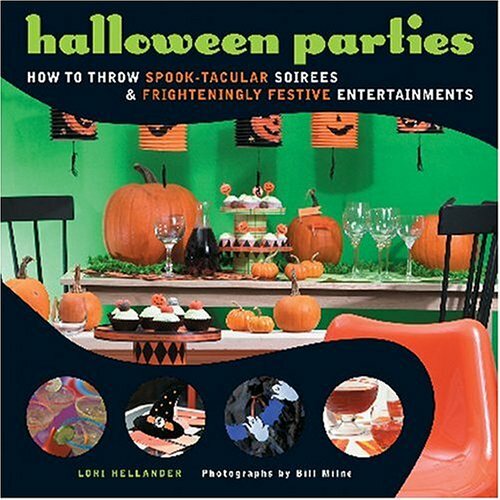 Bonus: Party recipes, favors, and costumes.“The decorating ideas and party tips in this colorful book can make your Halloween a treat.”—Country Almanac. This is an OK book of ideas but it is the same book that was printed with a different cover so I ended up with 2 of them. I consider that to be unfair! "Haunt Your House for Halloween", despite its ominous title, isn't really geared towards the scary side of Halloween.The book presents mainly tame Halloween décor and on that level it works very well.You just have to know what you're getting.Author Cindy Fuller wastes no time with lengthy histories of Halloween myths and traditions...we've all read those time and time again.She jumps right into the many projects found in this 96 page book. One of the semi-scary projects to be found is the Floating Phantom, made with just a handful of items that you may have at home or can be picked up at the local craft store.Made from primarily a piece of old white bed sheet (I prefer an off white or gray to make it seem no so "pure") and some line for hanging, you can achieve more of a terrifying look by drawing a more evil face on your phantom before hanging from a tree or perhaps an awning. Halloween wreaths are becoming quite common place today and allow a decorator to really use their own imagination in coming up with unique designs.There's a wonderful Halloween wreath, decorated with tiny ghosts that serves a dual function.It not only looks good, but you can stick suckers all around the wreath for a distinctive way of passing out candy to trick-or-treaters. A very simple, yet effective way to make scary décor for Halloween is to cut various shapes of ghosts, or bats, or other traditional Halloween characters out of Acetate and stick them to your windows, using light to create some very spooky silhouettes. Fuller also has many projects for décor inside the home including a neat little pumpkin patch village that can go on top of your mantle or on a table.There are also a number of items that can be made out of pine if you have the right tools to cut the wood.The book contains patterns for all of these wood projects. 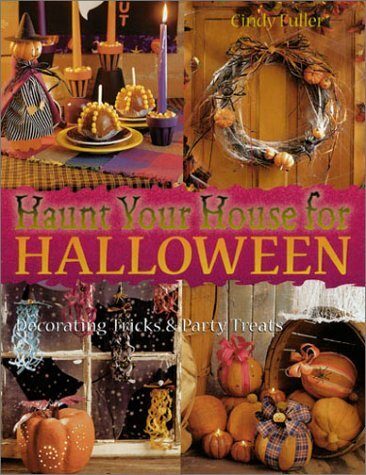 There are also things like recipes and décor for Halloween parties.The book features a full color photograph of each completed project and each is detailed in clear, concise instructions, and is accompanied by a full materials list.While it's more crafty than scary, "Haunt Your House for Halloween" presents some great-looking and simple projects to accent your home's holiday look. Cute book, but would have called it "How to Decorate Your Home for a Country Autumn"
Being a Halloween aficionado, I find this book cute, and full of good for ideas for a mild Halloween, but "haunted" is not what I would call the decorations.I still can't understand why some of the pumpkins have jester hats.Personally, I would call this more fall country decor than anything, but very cute and good ideas all around. I'm a serious Halloweenie.When I heard the title "Haunt Your House For Halloween:Decorating Tricks & Party Treats" the last thing I expected were cutsie country painted wood cutouts of pumkpin men (stacked 3 hight like snowmen), pigeon-looking blue crows, and BUNNIES with harlequin diamond painted ears.There were even oversided EGGS painted in yellow, orange, and white as if to be candy corn. If you're a serious country crafter who wants to spend a lot of time cutting shapes out of pine with your jigsaw and then painting them, this book has great ideas for you.Personally, I found that a lot of the instructions were quite lengthy and involved, and required a lot of money spent on materials and tools. I bought two Halloween books online this year in preparation for my 2nd annual haunted costume party.This one was a big disapointment for me.If you're looking for some really fantastic, easy, original and genuinely SPOOKY decorating and party ideas, try "Scary Scenes For Halloween" by Jill Williams Grover.I've left rave reviews for the wealth of amazing ideas I've gathered from her book. Haunt your house with cute stuff! Halloween is rivaled only by Christmas when it comes to the holidays that generate the most interest for Martha Stewart Living’s readers. Halloween is a compendium of the best Halloween ideas published in the magazine over the last decade. To help celebrate this ghoulish holiday, the editors of Martha Stewart Living bring us Halloween, a compilation of all the best tricks and treats of the spooky season. 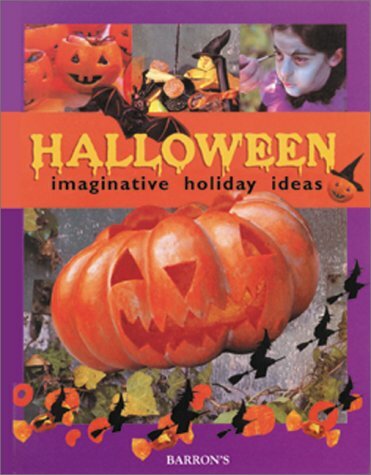 If you are a collector of Martha's Halloween Holiday Magazines then this book is just a compilation of all her awesome ideas over the years from those particular magazines. 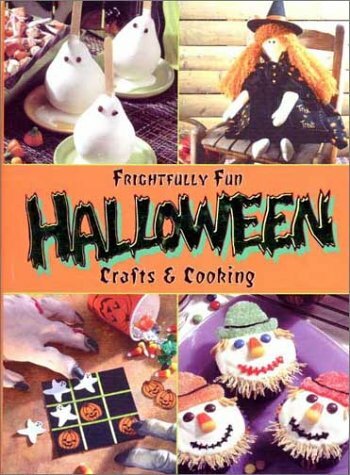 But as far as being all about Halloween decorating, this book is pretty much the best one I can think of. The photography and layout of the book is really good and constantly inspires me to get new ideas every time I read it. Great crafts, treats, costumes and more! 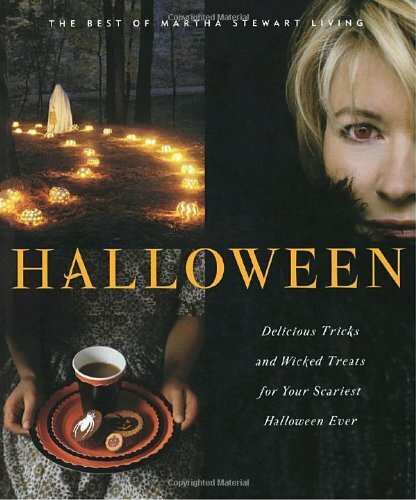 Halloween is one of my favorite holidays and this book has some great ideas for crafts, costumes and food. One of the best halloween inspired snacks was for ladies fingers and men's toes, I brought these to a Halloween party and they were a big hit. 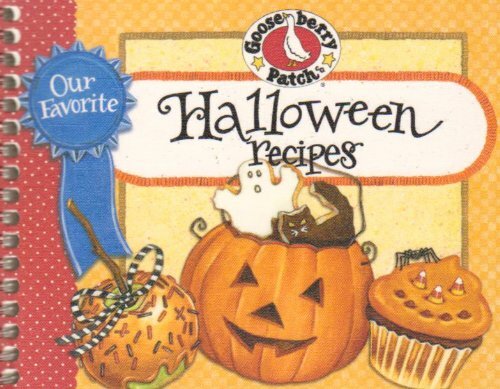 The crafts and recipes in this book are fairly easy to make with planning. Don't try to pull anything off at the last minute. But with some planning and the right tools/ingredients you can achieve a really beautiful finished product. Halloween is not a big deal here in Australia, so I was looking for a inspirational book with plenty of how-tos and ideas...I bought this book after combing the Martha Stewart website, expecting more of the same great stuff.I was a little disappointed when it arrived.Still a good book, but I'd recommend going though the website first - a lot of the stuff in this book is contained there anyway.The book has a very appealing look, and is still a good read, but for sheer volume of ideas, all with easy instuctions, use the website. 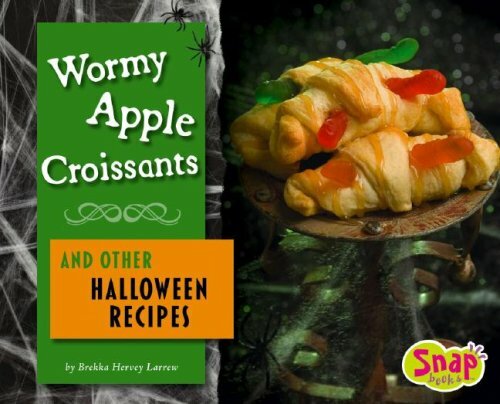 The imaginative new activity book Haunting on a Halloween will teach kids of all ages the art of Halloween party planning, with yummy ghoulish recipes and scary stories that will make your guests shriek! With fun tips on how to decorate the dinner table with headstone place settings, creating cool window designs, paper "bats," and much more, it is chock full of scary ideas. Kids learn to prepare their own jack-o-lanterns from scratch-starting with planting a pumpkin patch, growing the perfect pumpkin, carving the right designs, and toasting the seeds for snacks. Haunting on a Halloween encourages children to come up with their own ideas for decorations and activities, andincludes "Bright Ideas" sidebars that offer alternatives to the activities or to potentially hazardous situations, like using disposable glow sticks instead of candles in a jack-o-lantern. 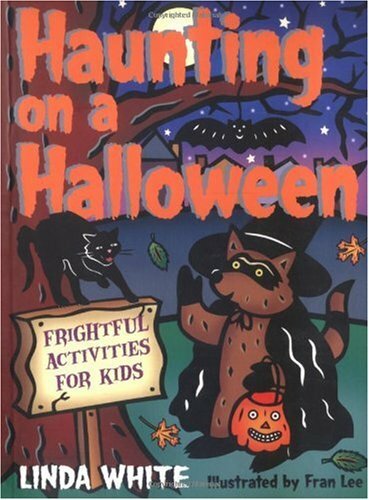 This book is also great for grown-ups who want to help their children to have a safe, yet happy, Halloween. Linda White is the author of Sleeping in a Sack, Cooking on a Stick, and Trekking on a Trail. She lives in Loveland, Colorado. good book for childrens parties. This is an excellent book, full of ideas and easy to understand instructions on how to create each project.Kasey Rogers was "Mrs. Tate" on the original "Bewitched" and she and Mark Wood (actor/singer/artist) have put together a wonderfully elegant (if you prefer elegance and mystique over skulls and horror Halloween . 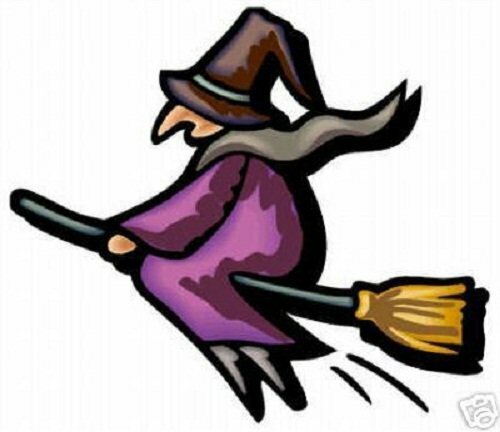 . . and I do) book.I also have another book by these authors as well:"Create a Bewitched Fall-o-ween: 45 Projects for Decorating and Entertaining." Special note to Amazon:Thank you for going above and beyond to find this book for me. 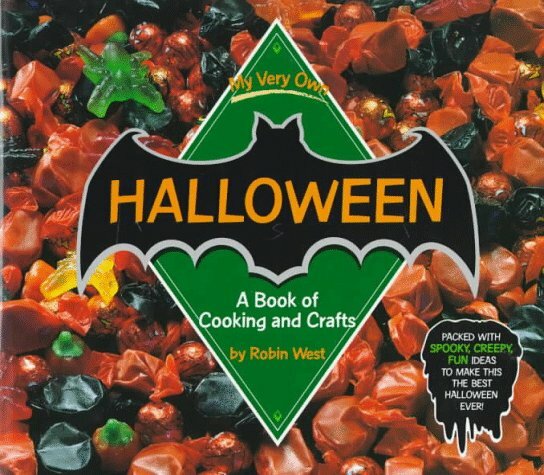 Great book with getting you started with Halloween projects. Good, but it tries hard to disguise the fact! 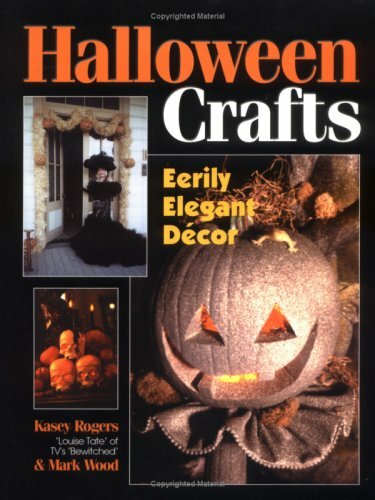 Since I live in Australia, and Halloween isn't a big deal here, I was looking for something inspirational with clear how-tos to get started with.When I first received this book I was disappointed, but it really started to grow on me!I actually ended up basing most of my decorating on ideas in this book, but I didn't realise it at first!The photos are grainy, and some of the instructions aren't all that clear, but once you get past that, it's not too bad!It has some good ideas for a Halloween first-timer like me, that will actually look a lot better than the photos in the book lead you to believe.Be warned though - most of the ideas involve pumpkins or gourds in one way or another! 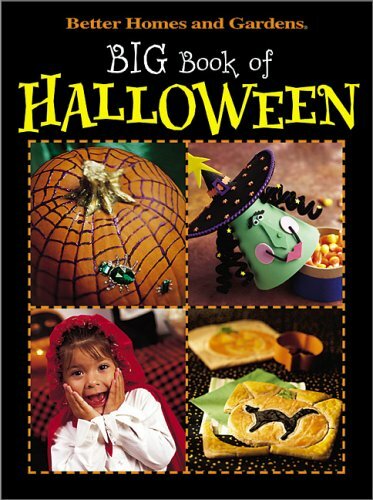 What this book really needs is a makeover - new photos, and a little re-working on some of the instructions, and it would be great.If glossy photos are your thing, skip this and try Martha Stewart's Halloween book instead, but this one is really a diamond in the rough. Elegant, indeed, but with a sense of spooky fun! Ideas with class, but practical. That's what I found in this delightful, pretty book. The materials recommended are, refreshingly, things I can actually get (and afford), right here in the isolated, imagination-starved desert of non-creativity where I live. It's so nice to see clearly written, well-conceived craft projects for Halloween that can really be done outside the major coastal metropolitan areas without paying for shipping and waiting six weeks for half the materials! After seeing how many 5 star reviews this book got I began to think there was something wrong with me.I didn't LOVE this book.One of the 1 star reviewers hit the nail on the head.There is just something about this book that I can't warm up to.The crafts were nice, different than most, but they were somewhat repetitive.Many, many pumpkin, squash, and gourd arrangements.There were a couple of other things interspersed, wreaths, figures, recipes.But mostly it was piles of pumpkins.And there was no joie de vive.Please excuse the French, but to say there was "no joy of life" in the book would sound a little stupid.Halloween is more a celebration of death.But most of the arrangements were dull. The two sections that caught my eye were the 'Old-Fashioned Party Fans and Favors' in Chapter 7, and Chapter 8. I have a weakness for Halloween collectibles and retro designs.And Chapter 8 had good party advice, like sticking to a theme rather than jumping all around. Create costumes from your closet and great face make-up tips! 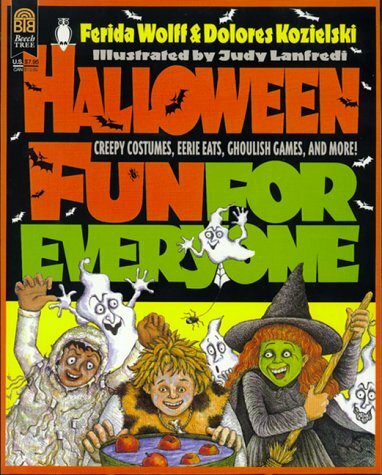 This book was written back in the 1980s before Halloween became so popular so it includes a lot of the "old time" hints we used when I was a kid. The costume chapters focus on creating costumes from items you have in your closet or those that can be borrowed or picked up at Goodwill.You used to see lots of kids in the costumes back in the day, but now you rarely see hobos, gypsies, gangsters or clowns. The section on face make up is wonderful for those who want to do makeup instead of a mask.Though the photos are black and white, they clearly show how to apply makeup and simple prosthetics to get good results. 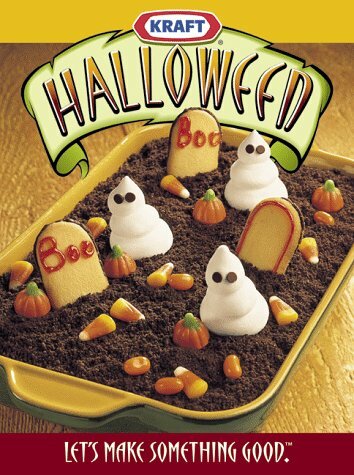 Howl with laughter and shriek with delight when you treat yourself to Frightfully Fun Halloween Crafts & Cooking. This book has some creative ideas, but also some things that are pretty cheesy.For the most part, I will use this book to get some ideas to use as jumping-off points for Halloween projects.Most of the book is filled up with recipes.Many of the recipes are pretty creative, but it also includes recipes for decorating cookies to look like spiders or ghosts. Full color, lots of huge photos. Unfortunately, bad binding: first time it's ever been opened and dozens of pages are dropping out. Crafts for families who are aiming to please the kids. Not crafts for kids to make all by theemselves. Mood is cute, non-historical, silly, hokey, occasionally country. The jack o' lantern designs seemed pretty original until I realised that the theory behind them was just to glue anything you can find onto the pumpkin-shell. Bits of wire, leaves, beads, glitter, whatever- just make it thematic. That seems to be the idea behind it. Still, that's pretty fun. The costumes were disappointing. Almost all for children, no-sew, quick and simple. The multi-wearer caterpillar was a pretty good idea, for example, but none of them looked very snazzy in execution. Not as artistic as the jack o' lanterns at all. The other decorative crafts were more artistic again. I think I may actually try those. There were a lot of lanterns, though they could have been better. I think I'll try making the crepe paper decoupage jack o' lantern basket. The party ideas were well-worn. For example, one of those beanbag toss games. Not as innovative as the rest. The food was the best part. They vary from long and complex, to no cooking required. Some look like they'd be very good to eat, and others seem to be mostly for looks (such as the scowling goblin head food sculpture.) I'm most likely to try the witch hat cookies, which have a cookie for the brim, a candy-filled ice cream cone for the peaked part of the hat, and icing for the hatband. The witch hat cake (made of precariously stacked cakes, then iced over) would actually be edible, too, and would look great. Like a lot of things in this book, that could be for a Harry Potter themed party, too! Rehashed and repackaged - Been there, done that! I bought this book for my daughter who seems to like Dora even though she doesn't watch her on tv.I wanted her to learn a little more about Halloween and not be as scared when trick-or-treaters came to the door.It worked!She really enjoys flipping the pages and they do last the test of time.They have been flipped numerous times a day for about 6 to 8 weeks and they look like new.The story is short and simple, but taught her matching when you have to find candy under the two pumpkins that match. Regardless of whether your child "knows" all about Dora or not, this is a fun Halloween book.Its a lift the flap adventure, and there's all kinds of neat things to find under the flaps.The book design is rather clever, with my kids' favorite part being the end where some of the Dora characters are dressed in various costumes and you have to lift the flap to see who is wearing them.Very cute!It's also a sturdy board book so no worries about having bent or torn pages.A must have for any preschooler who is learning about the fun of Halloween. My two year old loves reading this book all through the year.He just loves halloween and loves saying "ooooh..." when he sees a spider or bat, or "Boo" when he sees a ghost.This delightful little lift-the-flap book follows Dora on her quest to find Boot's bag of Halloween candy that has been stolen by Swiper. As in the show, she needs to consult with the map to find the way.Through the woods with Owls and Bats, into the pumpkin patch where you lift the flaps on the pumpkins to find Halloween treats, to finally the spooky haunted house witha ghost waiting at the door.Once inside, the little ones explore the haunted house by lifting up flaps and searching for the stolen bag of candy. 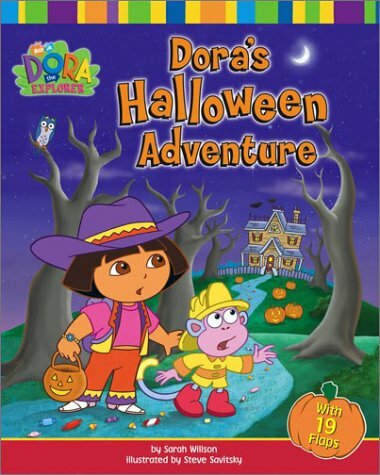 As delightful as the TV show, kids will just love following Dora on this spooky adventure and encountering all sorts of Halloween creatures along the way.Very enjoyable and already getting worn out in our household. Swiper has done it again!Where did that sneaky fox hide Boots' bag of Halloween candy? This board book of the immensely popular Latina explorer is filled with surprises for young readers.Lift 19 flaps to find a trick or a treat. Match the faces in a pumpkin patch.Guess who are the mystery guests waiting at the Haunted House, including the ghost with the orange tail. One of the better Dora stories.My daughters, ages 4 years 8 months and 2 years 10 months, have never met a Dora book they didn't like.This one is no exception. We are pleased to offer hundreds of eBooks for the Kindle. Click on our Editor Name next to the book title above (eBook-Ventures) to view all of the titles that are currently available. A boring Halloween party? The horror! Millions of Americans live to be scared silly, and for them October 31 marks the beginning of the holiday season: a reason to dress and act outrageously. 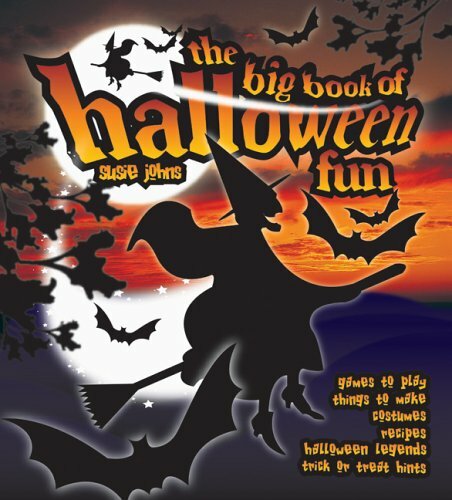 This hip, photograph-filled paperback, packed with recipes and crafts, makes entertaining on Allhallows' Eve terrifyingly easy. From a frightful dinner for four to a full-out, monster-mashing Haunted Mansion, Lori Hellander concocts six parties guaranteed to make guests scream in delight. The Hocus Pocus Potion Party highlights eerie elegance, while Tricks and Treats taps into Halloween nostalgia. Like a skilled carver attacking a pumpkin, Hellander chops up each themed party into manageable chunks: invitations; shopping and scheduling; decor and costumes; food and drink; games for all ages. But aspiring fete-ishists need not have tons of time or an armory of glue guns to get the parties going: there are plenty of quick and simple-to-execute ideas, plus useful tips for impromptu entertaining.AUTHOR BIO: LORI HELLANDER lives in New York City, but her work as a photo stylist takes her to many places on the map. She is a regular contributor to Country Living, Bon Appétit, and Mary Engelbreit's Home Companion, among other national publications, and has made several guest appearances on HGTV's Country Style and the Discovery Channel's Surprise by Design. This is one of those books that I like the *idea* of, but not so much the execution. It's gotten to the point where if a book has the word "spooky" (or a variation) on the cover, I'm just going to assume it's not. The idea - offering ideas for six themed parties - would make for an excellent book if they were all actually Halloween-themed. Sadly, even the Halloween-specific party suggestions fall a little flat. This book is perhaps not well named. It is NOT about spooky spectacular Halloween parties. You won't find creative decorating and innovative costume ideas. Rather it is a nice recipe book for adult dinners, fun cocktails, and elegant place settings for a seasonal supper party. It isn't a one-shop top for your Halloween party ideas, but I really like some of their magical spell ideas, and their fun dinner and drink recipes. I'm a huge Halloween fanatic and own quite a few books on the subject and I'm always looking for more with new and fresh ideas.This would be a good book for someone who is into the retro theme as the book seemed like it focused soley on that, but because that's not for me, I was sadly disappointed in this book.But if retro is your thing, it had some nice ideas. Nothing new in the recipe section either. Boring, ideas, not worth it! I rarely write reviews, but after I received this Halloween book, if you would even like to put it in that catagory, I felt I needed to save anyone from buying it! An avid celebrater of Halloween, I thought that I had to have this boook for my collection--the title itself was SO catchy. After looking at it, the book was returned.